Traditional theatre exercises in concert with their ensuing interpersonal relationships create dramatic interplay in the regional premiere of Annie Baker's Circle Mirror Transformation, now at Curious Theatre Company. 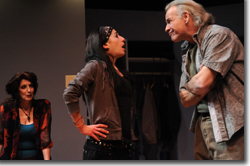 It's a must see for theatre aficionados, but accessible to general audiences as well, as they attune to the psychological and emotional subtext revealed through a half dozen improvisational techniques, as practiced by five misfits in a six-week adult creative drama class. 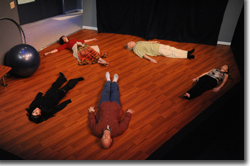 The synchronicity and psychic attunement of the group—James (Bob Buckley), Theresa (Barbra Andrews), Schultz (Mark Rubald), and Lauren (Meredith Young)—is tested by leader Marty (Erica Sarzin-Borrillo), beginning with a counting exercise in which everyone lies on the floor, unable to see each other. Someone begins and the idea is for others to follow in an extemporaneous manner, until the group gets from 1 to 10 without stepping on each other's impulses. The exercise is revisited each week, providing a metric for the group's progress. Other exercises provide a more aesthetic means for testing cohesion, such as building sentences, one word at a time, in a circle, or each member telling another member's life story after a heart-to-heart talk. It's a brilliant conceit that heals on a spiritual level. One wonders if, in this manner, contemporary psychotherapy could be weaned off its stupefying pharmacopeia aimed at mindless consumerism and corporate profits. Schultz is a shy divorcee who works thorough excruciating shyness to connect with the effusive Theresa; Lauren is a goth—heavy black mascara, black hair, black clothes—impatient with the process, eager to "learn" acting, but mistrusting of adults; James is always willing to take an interaction to its limits, on whatever level is necessary, which creates issues in his relationship with Marty, who, despite her personal work over the years, learns something life-changing about herself from Schultz. The ensemble's work is excellent all around. It's no mean feat for actors to play characters learning to be actors, which at a basic level involves being both believable and inept. Nice work by director Christopher Leo in coalescing these disparate forces. Most remarkable is the schema that enables all five characters to have a catharsis. 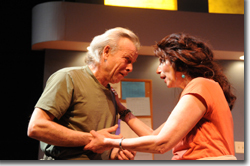 Curious Theatre Company's Circle Mirror Transformation runs through February 26th at the Acoma Center. 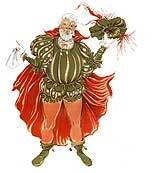 303-623-0524 or curioustheatre.org.